“Stay thirsty, my friends.” (or #STMF) has been a popular meme for a while. The gist: Keep challenging yourself. We all know that maintaining our liquid intake makes for a daily challenge, especially with today’s crazy lifestyles. But when the body is well hydrated, you look and feel your best. Here we give you the tips and tricks to ensure that hydration is a simple, habit-forming exercise. Read on and #STMF! Thanks to your kitchen sink, this is probably the easiest and least expensive option for staying hydrated. 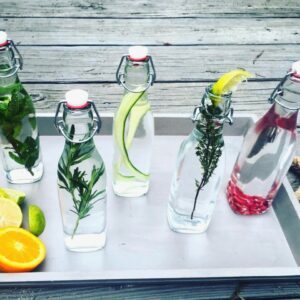 If water is too bland, infuse your H2O with fresh herbs and fresh fruits for at least 30 minutes. Here are some of our favorite combos for infused waters: raspberry, mango and lime; blackberry and lemon; carrot and mint; cucumber, lime and a splash of coconut water; pomegranate and pineapple; strawberries basil and lemon; grapefruit and rosemary; and pear and ginger. Try them all! Get into the habit of always carrying a water bottle, even if you’re not thirsty (mental note: water bottle goes hand in hand with keys and purse). A cute water bottle or fruit infuser water bottle can be motivating. Fill mason jars with water and pop them in the fridge. This makes it easier to add fresh herbs or fruit in the moment. 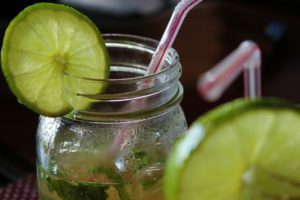 Mason jars are also great for portable salads, which are a hydrating alternative to H2O. Just add your favorite light dressing to fresh lettuces, cucumber, tomatoes and other veggie treats. Salads are a quick, healthy meal that increase your veggie and water intake and keep you from feeling sluggish. Plenty of Water = Plenty of Health Benefits. The benefits of water go beyond just quenching your thirst. Water helps you feel more focused and alert. 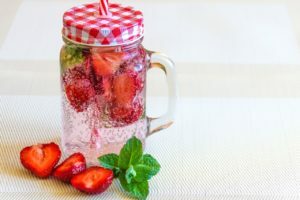 Increased water intake supports weight loss by naturally helping your body release fat cells and by satisfying your hunger pangs by triggering that “full” feeling. Water flushes toxins from your system, keeps your organs healthy and improves your complexion and skin texture. Remember to drink at least 8 glasses of water per day. With this as your basic guideline, you’ll be well on your way to a happier, healthier and more hydrated you.